Davide Mastracci (@DavideMastracci) is an investigative reporter at The Islamic Monthly and has written for Maisonneuve, Vice and the National Post. The Russia hysteria infecting political discourse in the United States has finally hit Canada. Last week, The Globe and Mail reported that Foreign Affairs Minister Chrystia Freeland’s Ukrainian grandfather was a high-ranking editor at a Nazi newspaper in occupied Poland. It is something she had known for more than twenty years, but hadn’t disclosed publicly. These nationalistic statements rest on the idea that the media and the government should work together to combat outside forces. On its face, any self-respecting journalist would reject this idea outright. This situation proves to be more ethically fraught, however, as reporters now find themselves wedged between self-interested Canadian politicians and a Russian government alleged to be using journalists as pawns for their own end. To top it all off, this is all unfolding in the midst of a broader conflict many are calling a new Cold War. Reporters now find themselves wedged between Canadian politicians and the Russian government. Claiming Russian interference in Western affairs is, accurate or not, a burgeoning trend. After the Democratic National Committee was hacked during the US election and compromising emails were sent to WikiLeaks, officials stated that the culprits were likely commissioned by (or members of) the Russian state. Germany has also accused Russia of hacking its Parliament computer network, and shutting down access to internet and telephone services for more than 900,000 people. There is not yet any definitive proof that it was Russian officials who unearthed and leaked the story about Freeland’s grandfather to media outlets, but there have been hints. 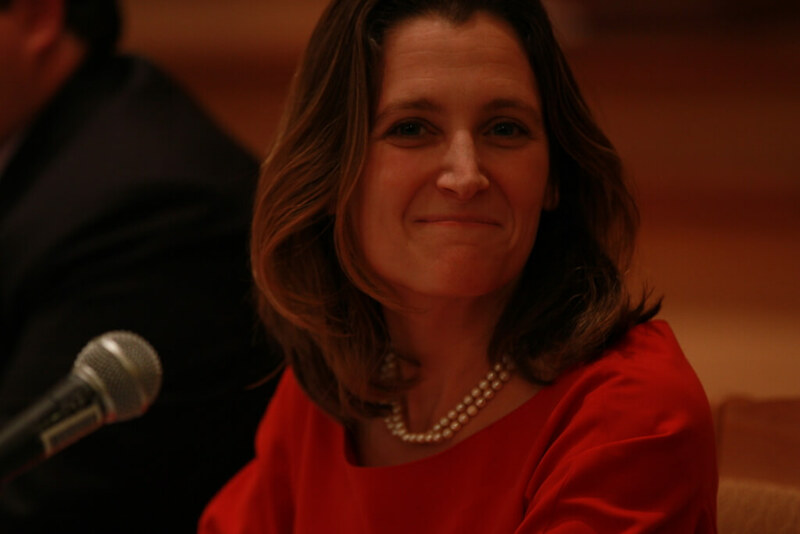 For one, it’s clear why Russia would want to target Freeland: she rose through the Liberal Party due in part to her anti-Russian and pro-Ukrainian views. In January 2014, Freeland expressed support for the Maidan protests against the Kremlin-backed Ukrainian government, characterizing demonstrators as freedom fighters—something that continued when the rallies turned into a full-scale violent conflict. She also called for sanctions against Russia, which the Canadian government eventually imposed in March 2014. In response, Russia banned Freeland from the country (along with twelve other Canadian officials). The ban has not yet been lifted. On March 6, Freeland announced that Canada would be extending its military mission in Ukraine for two years and by doing so, declared ongoing support in the country’s fight against pro-Russia separatists. The next day, the Globe published its story on Freeland’s grandfather. Kirill Kalinin, a spokesperson for the Russian embassy in Ottawa, denied that his government played any role in circulating the story to Globe reporter Robert Fife. Meanwhile, Alex Boykowich, a Ukrainian-Canadian member of the Communist Party of Canada, came forward, claiming he’d actually been responsible for unearthing the news. Regardless, Canadian officials have not minced words in accusing Russia of meddling in Canadian politics, and have now chastised journalists for moving the story from fringe websites—where it had been circulating—into the mainstream. Smear campaign or not, everything that Fife and the Globe reported was true, and could be corroborated independently of a potential Russian source, since all of the information the article relied upon was publicly available. The story was a newsworthy one, as Freeland always spoke highly of her grandfather and the effect he had on her, portraying him as a brave “lawyer and journalist” that became a “political refugee” after fleeing the Soviets, and ended up in a displaced person’s camp in Germany “like a lot of Ukrainians.” She also failed to acknowledge his past as a Nazi collaborator when asked about it directly after the news began circulating online. There is no doubt that many media organizations would publish the story had one of their researchers made the discovery. After all, outlets were quick to pick up news that Liberal cabinet minister Maryam Monsef was actually born about 200 kilometres from where she originally believed (due to the fact that her family were refugees fleeing violence). Conservative officials used Monsef’s situation to call for her to be stripped of her cabinet position. But now, because reports about Freeland’s family history appear to be coming from an increasingly unfriendly government, Conservatives and Liberals alike expect the media to join in with their united-we-stand posturing. In reporting the Freeland story, the Globe straddled the line of asserting independence from the Canadian government and potentially becoming an unwitting agent of an outside one. They did this by focusing on transparency. The second line of the Globe’s story notes that Freeland’s family history has become a “target for Russian forces seeking to discredit one of Canada’s highly placed defenders of Ukraine.” Fife also published an article the day prior, focusing on Freeland’s warnings of alleged Russian disinformation. Fife did fail to explicitly outline where he received his information regarding Freeland’s grandfather, but there is no direct evidence that he was, like Ling, contacted by the Russian embassy. His reporting gives the context needed to understand the hostile environment in which these claims were made—which in and of itself is news. Reprimanding Fife or the Globe for doing their job sets a bad precedent. If two governments start throwing shots at each other, the media must let the public know what’s unfolding. If we are indeed on the verge of a new Cold War, we can expect to see more examples of nation states feeding damaging—and salacious—information to the press. Some journalists will have a knee-jerk reaction, and feel the need to defend their own government. But recent history has shown that there are disastrous effects when the media fails to maintain independence due to a “wartime reporting” mentality. Judith Miller’s writing for The New York Times on Saddam Hussein’s non-existent Weapons of Mass Destruction program is a prime example. This flawed reporting may have been in the US government’s interest, and it certainly played a role in garnering public support for their invasion into Iraq. However, it was not in the interest of the 500,000 Iraqis killed, nor the more than 30,000 American soldiers who died in a war predicated on a lie. The Canadian media’s decision to report on Freeland’s Nazi collaborator grandfather is not a life-or-death issue. Yet as tensions continue to mount with Russia, it’s crucial that journalists keep a safe distance from jingoism at an early stage, and push back against those attempting to turn them into a mouthpiece for and defender of government institutions. To do so, journalists must get used to accusations that their stories make Vladimir Putin cackle—and report them anyway. What does it mean when the top three search results for “Sweden multiculturalism” all lead to misinformation and hate?